I have a 140mm aruco marker part of the buldled aruco DICT_5x5_1000 dictionary. 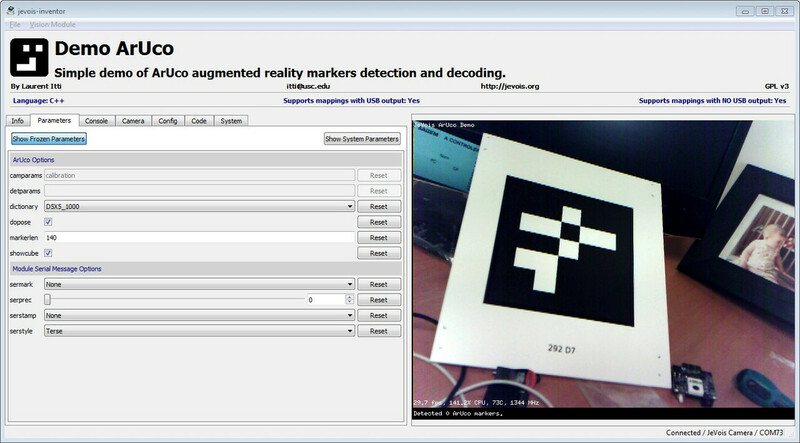 even though the marker is in complete view, i still observe "Detected 0 ArUco markers"
Using the same parameters, if I show the default aruco marker for instance in the top left corner of jevois-inventor GUI (which by the look of it is a 4x4 aruco marker) ==> then this marker is detected. It seems the dictionary param is ignored ? Do I do something wrong ? 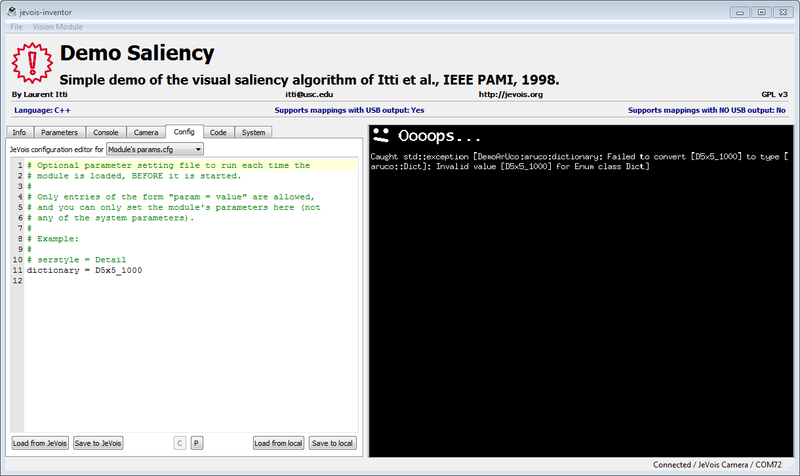 how can i change the dictionary param with console (text) interface instead of GUI ? i did find the `setparam dictionary D5x5_1000` and `getpar dictionary`commands. I can observe that it does report the correct dicitonary. To no avail. it seems that at runtime it just uses the default dictionary whatsoever. I think this parameter may not be updatable at run time. We will look into it. Maybe it needs to be frozen like camparams and detparams. Save the file, and the module will restart. The correct dictionary should now be loaded and in effect. Please let us know if it does not work and we will dig deeper. Note: This post was edited to use an uppercase X instead of the original (incorrect) lowercase x.
since the module no longer loads, the command "help2" no longer returns the module's help page. However, i'm pretty sure i saw D5x5_1000 in the list of possible values for dictionary. Indeed, we are working on trying to avoid this kind of problem in the inventor. It is a bit tough as we need to basically keep a module that has crashed in a somewhat running state so it can be fixed. This problem will be gone in the next version of the inventor. In the meantime, you can just load another module, and then under the System tab, export the microSD as virtual USB drive, and then you can go fix the params.cfg file inside the DemoArUco module. When JeVois reboots, it should load now. i'm wondering how small I can make those markers until the reported pose starts to have too high an error. The algorithm is supposed to have sub-pixel corner refinement. However, some JeVois users have reported that this does not work so well. 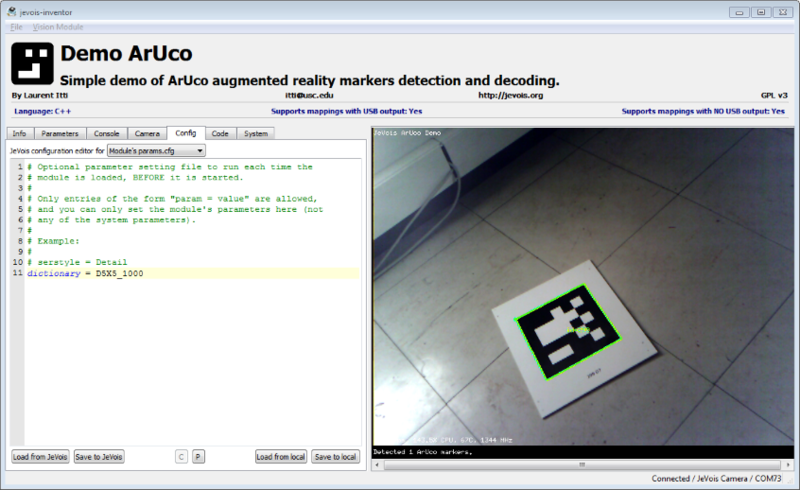 In practice, we can identify ArUco markers here down to about 20x20 pixels or sometimes smaller, but the accuracy of the 3D pose recovery is not great with such small markers.